And that was it. I stopped dead in my tracks. 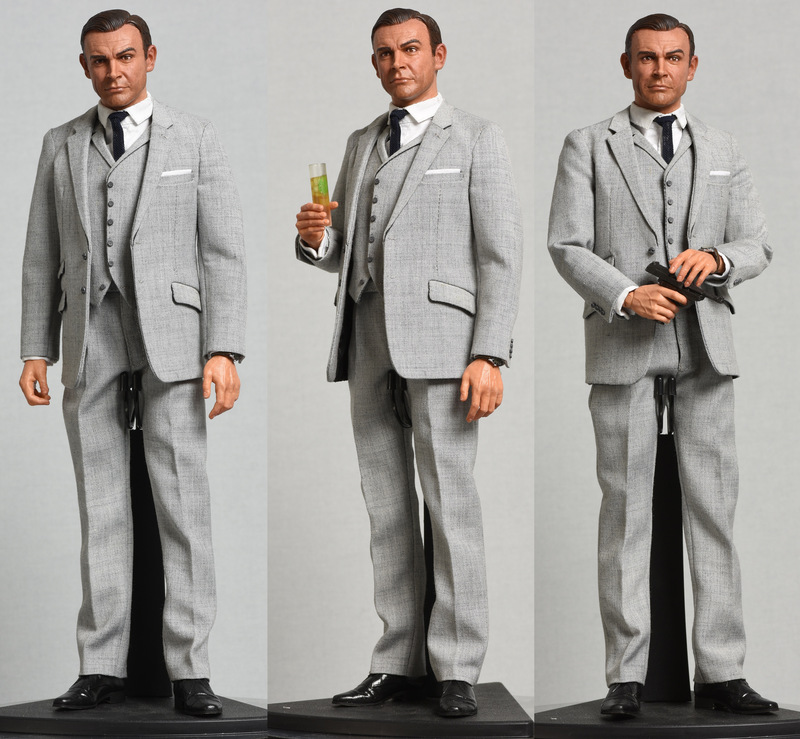 Here was, without a doubt, the most striking James Bond collectible I’d ever seen. 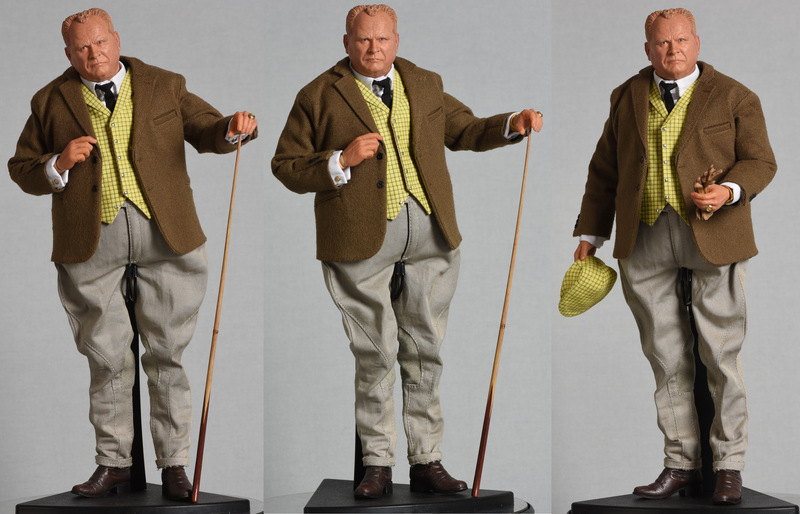 The figures, which go for 209.99 pounds each — or about $275 — are available for pre-order now and are due out in December. (Click here.) After that, the folks at BIG Giant are planning their first Roger Moore wave. With the release date so close, Mark Andrews, the company’s CEO, is lifting the veil on how BIG Chief is producing these remarkably detailed, high-end collectibles with this EXCLUSIVE behind-the-scenes look featuring a series of mostly never-published photos. Dan Greenfield: Tell us a little about BIG Chief itself. How did you get started and what are some of your other major licenses? Mark Andrews: BIG Chief was formed in 2011 with the dream of becoming the leading collectibles company in the UK. It was and still is a BIG dream and we are determined to get there. Our first major license was with BBC Worldwide for Doctor Who. At that time the BBC had had a great experience with an incredibly successful toy line and they were looking to expand into high-end collectables. So our timing was perfect and as luck would have it the Doctor at the time was the 11th Doctor, a.k.a Matt Smith, who was the first incarnation of the Time Lord to really hit a chord with audiences in the US. I would love to say it was an easy process starting out in the worst economic climate and frankly being somewhat green business-wise if I am honest. Nevertheless we persevered and two manufacturers later, two Amy Pond heads later, a heck of a lot of money later and a lot less hair left, here we are with exciting new licenses and much improved products. Sherlock was added to our license portfolio shortly after Doctor Who and more recently we signed with ITV Ventures for Thunderbirds Classic and the Gerry Anderson Portfolio. The really BIG news came in 2016 when we announced that we had acquired the rights to the James Bond movies. Dan: What was the impetus to do James Bond? Mark: It was pretty much a dream license for us from the day BIG Chief was formed, not just for commercial reasons, we are all BIG fans of the films. It seemed like a natural fit for us as a British company to be working on arguably the most iconic British brand. It was a long time in the making, however, with negotiations taking two years to finalize an agreement. As fans and collectors ourselves, we really wanted to do it right. That’s not saying that we think Bond is better than our other licenses. Moreover, we wanted to improve across the board. No one is more critical of our products than ourselves, but so much of creating and making a product is a learning curve, for our manufacturing partners as much as ourselves. So we have worked very, very hard to improve. We believe that fans will be delighted with their forthcoming pre-ordered figures. 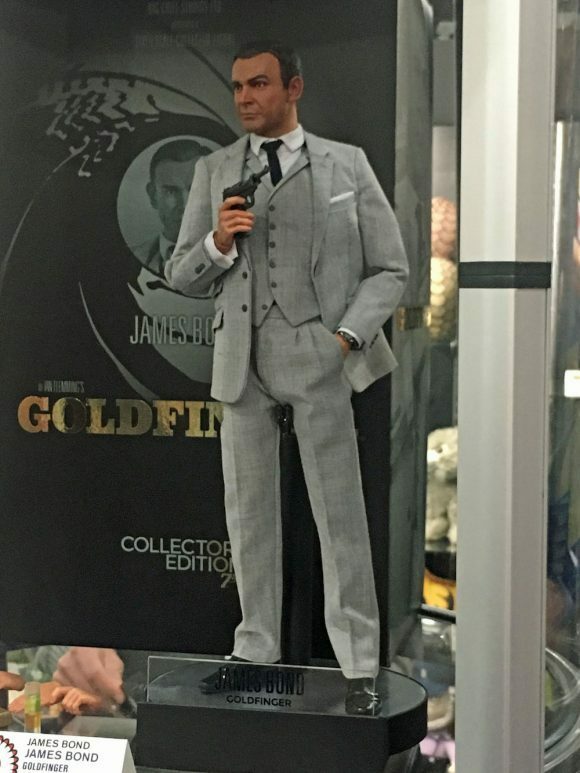 Dan: Compared to many other licenses, there’s relatively little in the way of modern Bond collectibles. How did you put this project together? Mark: Well the Bond brand is of course associated with numerous high-end, high-priced companies: Aston Martin of course, Omega, Bollinger to name but a few. So the perception is that the James Bond license is right up there with these brands. EON are very selective about who they partner with and for what categories. Let’s face it, they could license everything and anything but they are very protective and selective and you have to admire that in such a commercial world. 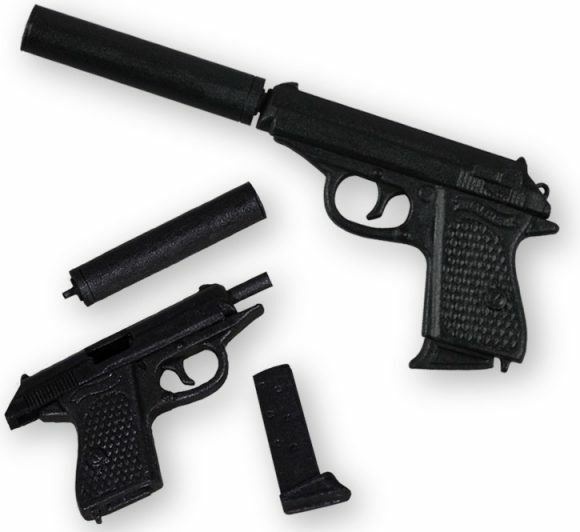 We had been actively interested in Bond for a number of years and in fact worked on several of the prop replicas in previous roles at other companies. Three members of our team also worked for Corgi for a short time too, so there’s a history and pedigree to our involvement. We approached IMG at a licensing event in the UK and followed on that meeting with samples of our products. Sherlock in particular proved to be a hit with Barbara Broccoli herself. After that, all went quiet and it seemed like figural Bond product would never see the light of day. Still we persisted, pushing the “Britishness” of working with BIG Chief and lucky for us it paid off. Dan: Do you also have to secure the individual likeness licenses or did it all go through EON? Mark: We work very closely with both IMG and EON directly. All of our likenesses are approved directly through EON, by them and with final sign-off from Barbara Broccoli and Michael G. Wilson. They have likeness rights for most actors that have appeared in a Bond film. Any likenesses we would need to secure at a later date would be done in conjunction with, and the approval of, EON. Dan: Have you gotten any feedback from Sean Connery? Mark: We have not had the pleasure of meeting him yet, but we would certainly love to. Especially as I myself am a huge Indiana Jones fan. As all approvals are handled through EON, we do not have direct contact through agents or an actor’s estate. Dan: What’s been the biggest challenge in producing these figures so accurately? Walk us through how it works. 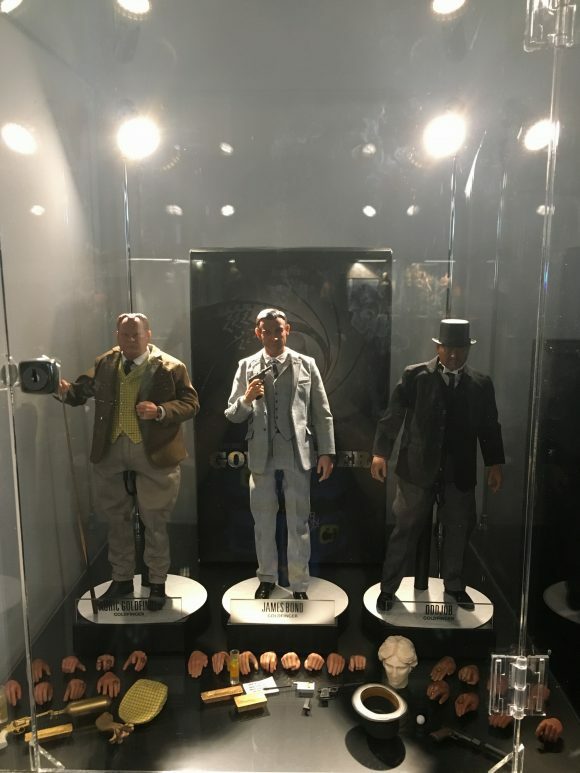 Mark: As I mentioned earlier, we have truly worked tirelessly to ensure that these figures are the most faithfully produced, accurate representations of the characters as they appeared on screen. With each figure that we have worked on thus far, we have done our best to improve with each release. Frustratingly, things do not always work out the way that you want… flat paint here, baggy pants there, loose arms here, broken glasses there… the perils of dealing with manufacturers on the other side of the world. So we were and remain determined to ensure that all of our future products would not see a repeat of such issues. To that end, we pushed every department to improve, from head-portrait sculpting and paint application, to stunningly tailored clothing and gorgeous packaging. 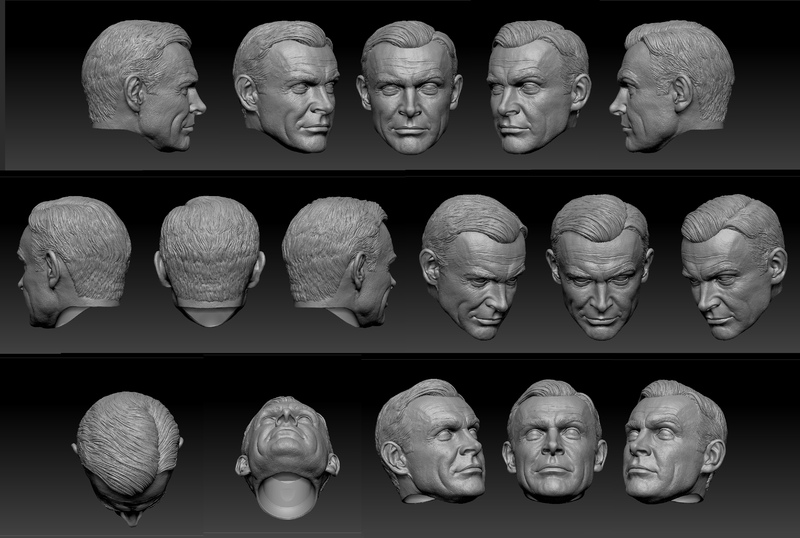 All of our head portraits are now achieved digitally, which allows for incredibly realistic skin texture to be applied and very fine realistic hair to be sculpted. Digital sculpting brings its own set of issues, however, as distortion from the virtual lenses used in 3D sculpting software applications tends to result in printed outputs that are off. 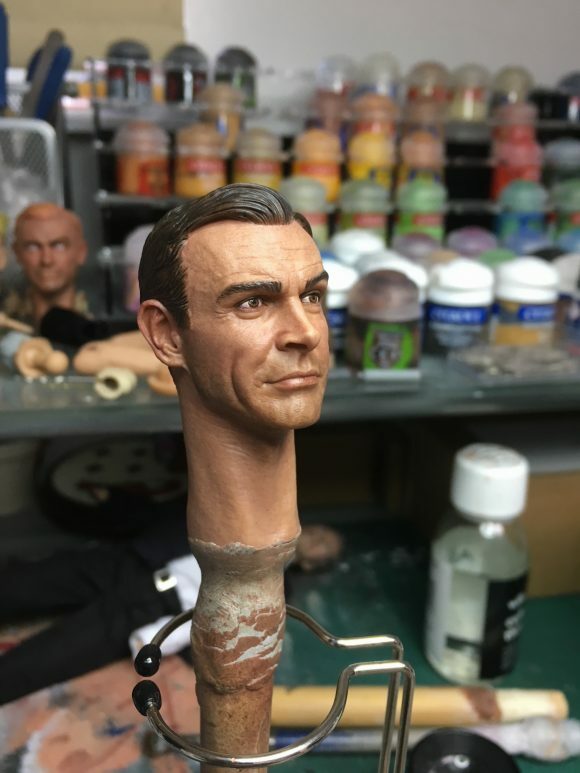 Tony (Leetham), who heads up sculpting and model-making, was steadfast and carried extensive tests with our Connery head to remove the distortion. Some six or seven outputs later we had achieved the perfect Bond. Prototype heads are output at 100 percent so that our artists can apply the paint ready for approval. Everything has to be approved: hands, accessories and of course the all-important costume. We go through many iterations before arriving at the final prototype that we ourselves are satisfied with. If it does not meet our strict standards, then it is adjusted before being presented to EON for their comments. Once approved, tooling masters are output at 106 percent, enlarged to allow for shrinkage during the injection moulding process. These tooling masters have to be duplicated to produce exact copies in polyurethane resin, which form the tool patterns to create the metal moulds. Once tooling is completed and the costume is approved, the vendor produces pre-production samples that are sent through to us for comment. There are usually a number of final tweaks that need to be made, but these are usually minor and so once addressed and approved by ourselves and EON, mass production gets underway. Dan: I really have to know: How in the world did you get these clothes to hang so well? Civilian clothes are notoriously difficult to reproduce without looking bulky and, well, a little silly. Tell us about the tailoring. Mark: Well, you have to be a fully paid-up member of the Magic Circle to know the answer to that question. You know it’s funny when you say civilian clothes being difficult, you are so right. We are all BIG fans of Hot Toys and their amazing figures, but in a way as stunning as their costuming is, and it is mind-blowingly good, they kind of have it easy as the majority of their figures are based on comic book, or sci-fi/fantasy characters, who of course wear other-worldly, outlandish costumes. 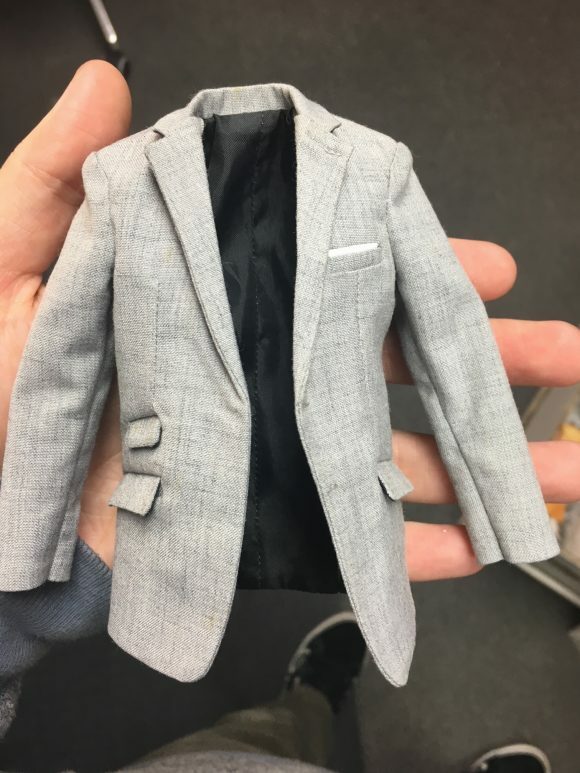 Let’s face it, we all see men in suits every day of our lives either on the way to work, or at work, but it’s not that often that you get to see someone in their super-suit. As such, we all have a frame of reference of what a suit should look like and how it should fall. To that end we were determined to nail the tailoring. 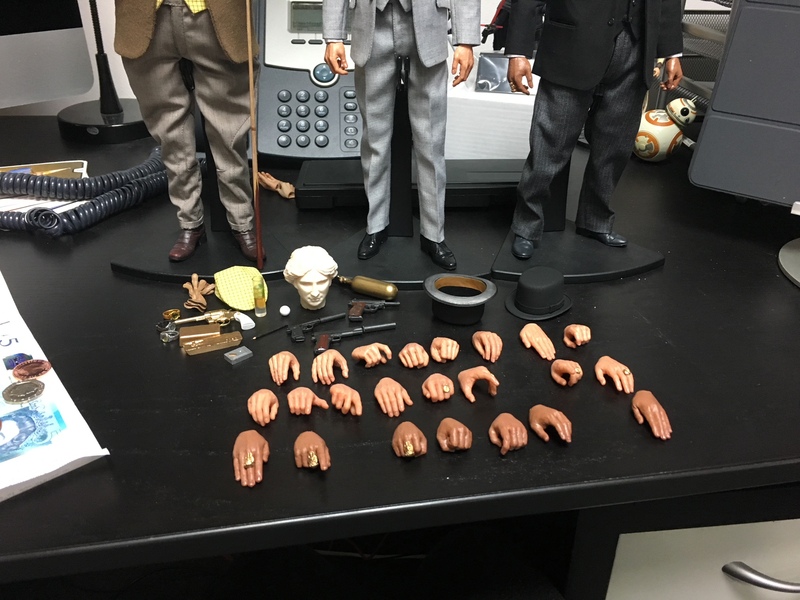 Gregg (Andrews) worked relentlessly with our vendors on the fat suits for both Goldfinger and Oddjob, which themselves have to be the correct fit before the clothing is added on top. I will be honest, I had my doubts it would work and firmly believed that we would need to tool up special belly components for these characters. I am happy to say that I was wrong and Gregg proved that. There were a number of revisions and minor tweaks as one millimeter at 1/6th scale is a lot. The fabric selection is key too as fabric generally is manufactured for 1/1-scale people. It can be quite hard to find a thin enough material that will simulate the original costume at scale without looking bulky or baggy. We have fallen foul of this with some of our earlier figures and have learned the hard way. 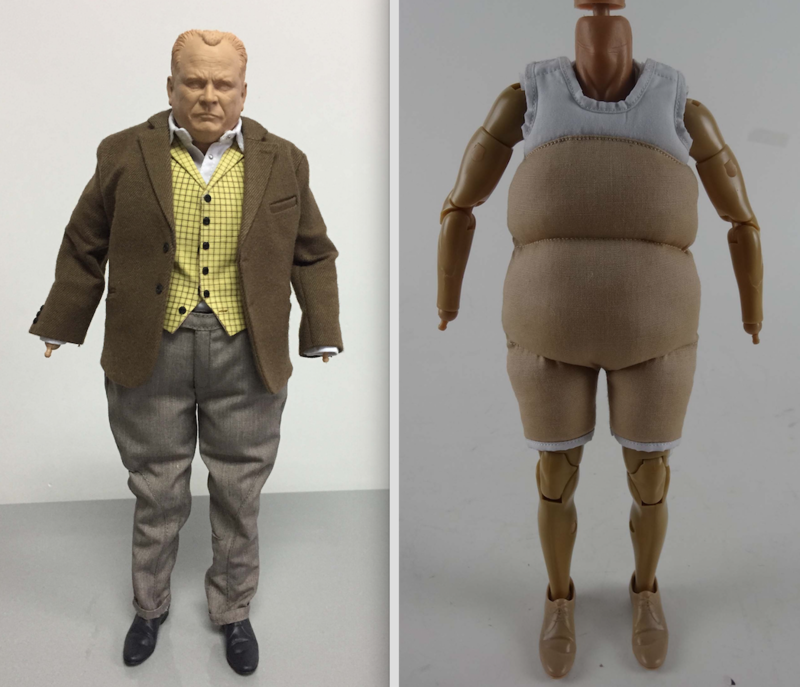 So extra effort and attention was paid to ensure that these costumes, and all our forthcoming figure costumes, will be the very best reproductions in miniature. Dan: What’s been the best part of doing this? Mark: Being able to work on something as prestigious as James Bond and working with EON, who are a closely knit organization. Developing figures of characters we have loved for years. Making something that we truly hope the fans will love and want to collect more of. Dan: What’s the biggest surprise you’ve encountered? Mark: The passion and dedication of the team we work with at EON.Of course we know it’s a living for them, but Bond is their baby and they nurture and look after it like no one else could. They have been a pleasure to work with and we look forward to many, many years partnering with them. Dan: The first wave is Bond, Goldfinger and Oddjob. I know you have other figures planned. What can fans look forward to next? Mark: We will be focusing on the classic Bond for the next few waves. Up next is Live and Let Die, which will feature Solitaire, Baron Samedi and of course Roger Moore as Bond. These will be available to pre-order soon with an expected release of late spring/early summer. We have all of the Bond films on our license and we will get to all of them in time. James Bond has returned! 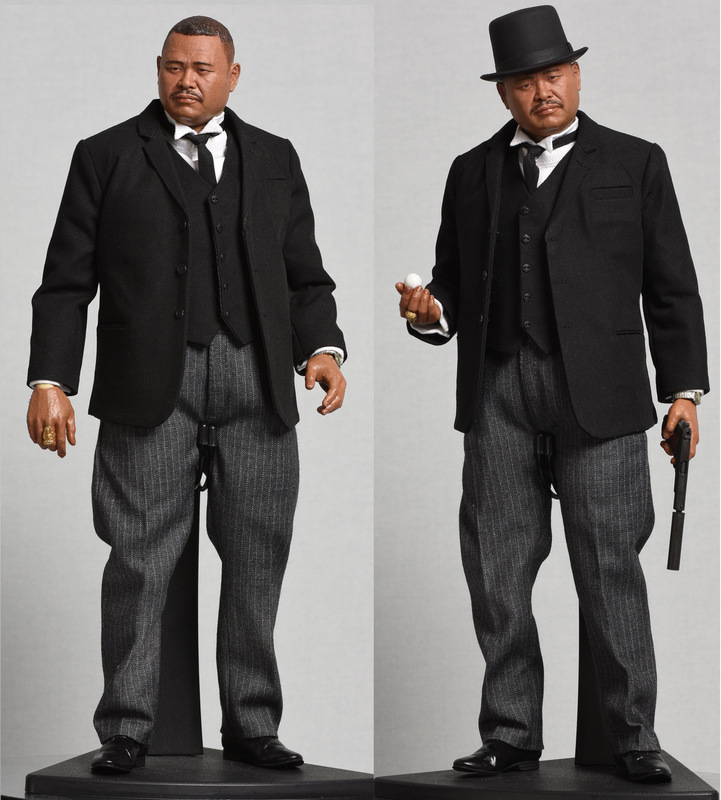 For more info on BIG Chief Studios’ 007 series — including how to order — click here. Nicely Done! Please send all info to my email.